Thanksgiving is the one big feast I do...yes, there are other parties, but they're all more casual. 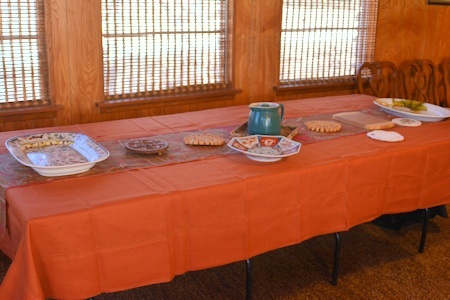 For Thanksgiving, I pull out all the stops in terms of table decorations and food. (At my level, that is. Others do much more.) Ordinarily, the prep starts back in October and carries on in an orderly fashion. This year, however, the discovery that my husband has another cancer (discovery made about two weeks ago) threw my prepartion for a loop. That plus various things in the Outer Real World. However--though today has been a mad scramble and I'm not done yet--preparation has made progress. This is the table where we'll eat, across the room from the buffet layout. You'll notice the plates don't match. It's a feature, not a bug--didn't have enough plates in the pattern I grew up with (the multi-colored flowers) and bought a set of six blue-and-whites to alternate with them. No two of the blue-and-whites are the same--they're replicas of older stuff. This table is newer, a major splurge a few years ago. Before that used two tables that weren't the same width or height, and with unreliable drop-leaves. One was the dining room table I remember from childhood; one is the one we bought a few years after we married. Worked for years. is to remind me to lay out the apples and grapes artistically in the morning. 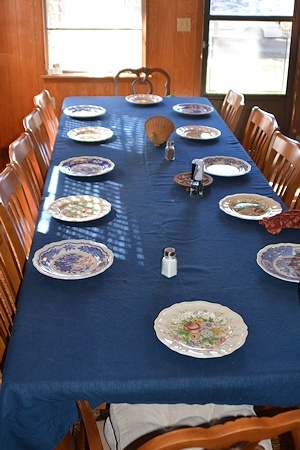 Yes, the plates will be centered on the chairs, and everyone will have flatware. Right now there's a pumpkin pie in the oven and I'm relaxing online instead of doing the remaining rounds of chopping, dicing, slicing and sauteing so that tomorrow I can put things together fast. I have a pint of homemade spiced pear/apple/red wine glaze for the ham in the fridge, the turkeys are mostly thawed, and all the ingredients for my half of the vegetable dishes (guests are bringing some, plus rolls, and desserts) are all in place, except for some sauted onions and garlic. Friends are bringing homemade cranberry sauce, sweet potato/apple saute, green bean casserole, pecan pie, apple pie, cranberry nut bread. Should you wonder if we can eat all that...no, but we count on leftovers, and also having enough for any person who needs it. Should you wonder why I took the pictures today, it's because many Thanksgivings running, I've been too busy and distracted to think about pictures until too late, as the others' taillights were vanishing up the street. Maybe I'll get lucky this year and get a picture of the table in its full array, but probably not. "Hey, Elizabeth, where's that little dish to put the olives in?" What are we thankful for? Life. Health, however it is. Friends. And having a day to celebrate them. There's more, but...I need to go dice some more onion and garlic and get with the slicing of carrot and celery sticks and the chopping of parsley and cilantro. According to the fashion sites, mixed plates and cutlery are fashionable. *shrugs* I never thought that everything had to match anyway. Hope you do remember to take pictures after everything is in place but more importantly, have a wonderful day tomorrow and enjoy being with family and friends. Yeah, some years after I was doing it, I noticed that it was showing up in the catalogs of kitchen/home decorating places. I liked it the first time I did it (with some other plates) and if you alternate them, it looks planned. And offers more colors and so on. When I was a kid, everything had to match. Yay for diversity! This year, Thanksgiving is being too small for a party - just my parents and me. One sister is spending it with her husband's family, the other with friends (she and her husband just moved back into the area, and want to reconnect). So we're going out for dinner, hope it will be good - the restaurant is excellent, but whether they can manage a good Thanksgiving dinner is another matter. However, I'm still making pies - two pumpkin for the church Thanksgiving dinner, and one blueberry to share with my parents. Got the pumpkin out the door way late, but they're delivered now (whew!). Homemade crust and Libby's, according to the recipe on the can, for filling. I made 8 crusts (because it's not hard to make more - sort of an assembly line); two for the pumpkins, two for the blueberry, and the other four will go into the freezer and be used at Christmas (when I'll make a lot more pies! Blueberry, homemade pumpkin (I've already roasted them, the puree is in the freezer), mince, maybe pecan or apple...). I should cook down the blueberries and leave the filling to meld overnight - whether I actually do will depend on whether my eyes will stay open when I've taken care of online chores (and whether my knee will support me - it was complaining, but I've got heat on it (a buckwheat bag) and it feels better). I do enjoy seeing how other people do the feasts - not that I'm going to change (much), but it's nice. So thanks for sharing! I like that traditions are different, and that people keep their own. Also very thankful that I have guests willing to put up with mine (or my version of my mother's--there are changes. Oh, and meant to add that I envy your hand with pastry. My mother made great pie pastry--mine nowhere near as good--so I use refrigerated pastry. Not as good as my mother's, either, but at least I didn't have to struggle and fail and have it my own fault. I struggled for years, then found Cook's Illustrated vodka crust. It makes it easy - lots more liquid, so it rolls out smoothly and doesn't crack, but no (extra) gluten forming, so it doesn't shrink back and it's still flaky. Since I discovered that, I've taken over making the pies for my family - Mom retired, not sure whether it was because my crusts were better (which she said) or she was tired of making the pies (quite likely). Have a wonderful Thanksgiving, Elizabeth! When I was still a proper NYC housewife, I used to collect dessert plates from jumble sales and junk shops - dessert never matched. I'm so sorry to read of your husband's renewed problems. I hope this Thanksgiving is full of happiness for you, your family and friends. Fill yourselves with joy and light to sustain you through the dark days to come. Best wishes to you and your family from a sufferer of Thanksgiving envy in the UK - the mixed plates look lovely. Goose was more-or-less eclipsed by turkey here after WW2, but it started to make a come-back in the 1980s. We've had a goose at Christmas for at least the last decade (despite, as it happens, being nominally Jewish) but it's only a couple of years since someone looked me up and down in the butcher's shop and said, 'Oh, we're traditional - we always have turkey.' I held onto my straight face and just nodded. But the smell of roasting goose is one of those things that would haunt me if I became vegetarian. Or just too poor to buy one. Roast goose with caramelised apples and Calvados this year! That's funny--about turkeys now being "traditional" in the UK. If the Pilgrims had been better shots with their blunderbusses, they might have had wild goose (although--I don't know when migrating goose leave Massachusetts, come to think of it.) I think my mother and I didn't really know how to cook goose--it was good, but "caramelised apples and Calvados" with it sounds...incredible. One year, friends of ours brought along a wild turkey that John had shot and Ellen had roasted. A wild turkey that's been eating acorns is an incredible flavor. So good. Very different from the store-bought turkey. I use a combination of bread stuffing and cornbread stuffing, with a lot of onion, celery, and parsley in it. My mother's formula was 1/3 crumbled cornbread to 2/3 dried bread crumbs. Lots of diced onion and chopped celery, including the leaves, and lots of chopped parsley. I'm traditional in that, but usually use commercial cornbread & breadcrumbs in packets. Now cornbread is something we really can't get here. We can buy the yellow sort of cornmeal - labelled polenta but I think it's the same thing - and make our own. But sugar or no sugar? That is the great dividing line and it's "tradition" in each family to do sugar/no sugar. My mother was "a little sugar" for eating cornbread, but "no sugar" when used in stuffing. I suspect her two grandmothers differed. We are also stuffing v. dressing people (though we call it both, and make enough that some has to be baked separately. But I think the turkey--esp. the commercial turkeys--are so bland they need the onion/celery/parsley in abundance inside--and I use a lot of sage. A LOT of sage, plus other herbs. My boss makes stuffing with cornbread (crumbled corn muffins left out to dry a bit) and turkey sausage. I don't eat it because of a sensitivity to something in sausage but people love it. Happy Thanksgiving! My son-who-lives-in-town and I are joining friends at a restaurant for the feast today. The other two sons are in Seattle and near Nashville, and since local son cooks for a living, we don't cook unless it can be all of us underfoot in a small kitchen and laughing. Best wishes to all your family and friends! Our Thanksgiving is kinda mucked up. I started a new job this month, so we drove down to my parent's in Phoenix yesterday afternoon, got there midnightish. My Dad proclaimed that Mom and I wouldn't make dinner as she's had some pretty bad health issues this year, but he wasn't able to make reservations at a restaurant. So we may end up going to a deli for dinner. Yours sounds like a heck of a spread. Have a wonderful time with your friends and family and celebrate what you've got, you never know what the next year will bring. Your buffet tablecloth looks, in the photo, rather like my mother's Christmas tablecloth. As you know, today has been an ordinary working day here (and I was on grandmother duty, and very thankful I wasn't expected to produce a feast for tonight! ), but this year my daughter is doing Christmas for the first time. She is talking of a free-range chicken; we would prefer duck but she says she doesn't like that. Traditionally - at least, as far back as my memory goes, and that is now not far off 60 years (I think the first Christmas I remember was when I was 4) - the Christmas feast is turkey, with "all the trimmings" - chestnut stuffing up one end, sausagemeat stuffing up the other, bacon that was layered over the breast to keep it moist, etc, plus roast potatoes, Brussels sprouts, several other vegetables according to taste (broad beans, always, in my family - my mother freezes them each summer and we had them one year and it became a tradition). Roast potatoes and roast parsnips, always. And giblet gravy. Bread sauce and/or redcurrant jelly (in recent years, cranberries have become available, so we make cranberry sauce now). All this is followed by Christmas pudding served with brandy butter, and, as if this were not enough, in my family we always had "dessert", which I think was some kind of folk memory of the "13 desserts" of Provence, because it always included nuts, fruit, almonds-and-raisins and dried figs, plus a variety of sweets. The adults drank champagne cocktails, and the kids had a fruit drink of some kind. As we have got older, we have been content with a token chocolate with our coffee, and kept the traditional dessert for another day! If we needed to eat again, it would usually be a slice or two of ham and some fruit. My father used to be given a crate of Naval oranges by someone, which were so incredibly good; even now, we speak of "Christmas oranges" and it is sad that there isn't a crateful keeping cold on the front porch! We have missed them ever since they stopped coming. And, you see, the next day is Boxing Day, and my aunt and her family used to come over, so we always had another feast, usually cold turkey, ham, vegetables or salad, and this was followed by the Boxing Day trifle my aunt made (and later my daughter - and I was so disappointed when I made it again a couple of years ago and didn't like it!). In our family, mince pies, Christmas cake, etc, tend to get eaten at the lighter meal of the day. As you say, each family has their own traditions. Ours are different now - we are grown and flown, and our spouses have brought their own traditions.... but it's our major family festival, even for those who don't celebrate the Nativity. Over here, one can say "Happy Christmas" to anybody, because almost everybody celebrates in some way.